Initially Mount Burgess entered Namibia to focus on diamond exploration in the Tsumkwe region of Northeast Namibia, where it found three kimberlites. Although these kimberlites were not diamondiferous, during this exploration it became apparent that the area being explored for diamonds also contained a Neoproterozoic belt which spanned the border between NE Namibia and NW Botswana, which was highly prospective for base metals. Forrester went to Botswana and secured that portion of the belt to discover it already had base metals exploration on it including zinc, lead and silver. That brings us to where the company is today, driving forward with the Kihabe Base Metals Project located in Western Ngamiland, Botswana, 700km Northwest of the capital Gaborone and 350km to the nearest town of Maun in Botswana. The project had historic drilling undertaken by BHP Billiton in the 1980s before Namibia became independent and had provided some very good results. However, Forrester says Billiton ran into problems, as at the time the project was extremely remote and difficult to access from within Botswana. While the Dobe border gate between Botswana and what was then South West Africa (now Namibia) was actually on the project exploration licence, it had been closed for political reasons, as at that time South West Africa was under the control of South Africa’s apartheid government. With the Dobe border gate being closed it was not possible to transport concentrate to the Grootfontein railhead in what is now Namibia, so that it could be railed down to Walvis Bay port for shipment to a smelter. Consequently, Billiton abandoned the project which Mount Burgess picked up in 2003. Through negotiation with both the Namibian and Botswana Mining Ministries, Forrester got the Dobe border gate re-opened such that the project can now be accessed from both Botswana and Namibia. Since then Mount Burgess has been well occupied developing the Kihabe resource and the Nxuu resource, which combine to around 25 million tonnes (mt) based on JORC 2004 compliance. With a current grade showing at 3%, Forrester believes that number has been underestimated. 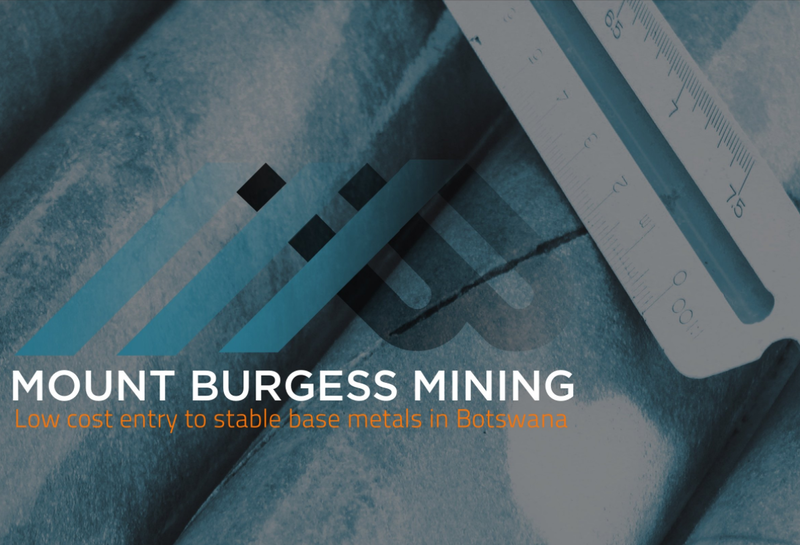 Mount Burgess’ forthcoming drilling programme will aim to consolidate the results it is experiencing with diamond core drilling. Forrester’s next step at the Kihabe project is to concentrate on the Nxuu resource and press ahead with diamond core drilling so management can be assured of what the ultimate grade of the resource will be. If the grade increases by the aforementioned 60% then, as Forrester asserts, it will substantially benefit the economics of the whole project. Secondly, the drilling will enable Mount Burgess to define the resource in a measured and indicated category compliant with the 2012 JORC code. The Nxuu resource will take priority as Mount Burgess treads the path to production. Nxuu is a shallow, basin shape resource with a maximum depth of mineralisation at just 60 metres. In addition the ore is completely oxidised for both lead and zinc. A process has already been devised to produce zinc metal on site through solvent extraction and electro-winning. “It’s also looking likely with the next technology available that we will be able to produce lead metal on site. If we can produce those metals on site it is going to eliminate the costs of transporting concentrate from a country that doesn’t have a port,” explains Forrester. Nxuu’s low cost nature is going to remove a significant barrier to reaching commercial production. Mount Burgess can take this project forward based on this deposit without having to raise large sums of capital for development from the financial markets. The combination of potential for open pit mining, not having to transport double the amount of raw material by processing on site, the low strip ratio and a production rate of around 750,000 tonnes per year (tpa) results in the project being low cost in capital expenditure and in production costs. “It’s not going to be of high capital expenditure, probably in the region of $50 million for the whole project,” predicts Forrester. Albeit remote, the project has access to a number of key infrastructure components necessary for a producing mine. It is located 350km from the nearest town in Botswana which is Maun, which has an international airport. The Dobe border gate between Botswana and Namibia is situated on the company’s Kihabe project Prospecting Licence, allowing access to Grootfontein in Namibia where there is a railhead. Also situated on the Kihabe project exploration licence is the Xai Xai airstrip. Forrester confirms that the access road to the Kihabe project has now been upgraded with the potential for it to later be sealed. If the company can produce metal on site it will eliminate the need to transport and ship large tonnages of concentrate. It will further eliminate the need to negotiate with smelters in various parts of the world. He also highlights how there are many far more isolated projects in the world which are in operation. While Botswana ranks second in Africa for doing business according to the Fraser Institute and is a stable and peaceful country, an area where Mount Burgess has had rather more fraught relations with the government is in getting access to power on site. Grid power to the site was originally pledged for 2012, a date on which Forrester had leveraged the feasibility study. However, with no electrification transpiring the feasibility could not be undertaken and the domino effect saw the Botswanan authorities decide not to renew Mount Burgess’ licence. Having bounced around the Botswana courts for three years Forrester appealed directly to President Khama highlighting the fact that it was not Mount Burgess’ responsibility to install power and there was little the company could do to help things along. Forrester believes his appeal to President Khama lead to Mount Burgess being invited to apply for a new exploration licence to cover the Kihabe project. The application for a new exploration licence was granted last year which runs for seven years, so Forrester does not expect to run into this problem again. The government plans to refurbish the original Morupule A 120 MW coal fired power unit. It further plans to repair three of the four 150 MW Morupule B coal fired power units which have caused all the problems and delays in upgrading Botswana’s grid power output. Contracts for the construction of a further two 150 MW Morupule B coal fired power units have been awarded to Marubeni and Posco Energy. However, construction of these two further units is awaiting the provision of guarantees from the Botswana Power Corporation. Forrester has not completely ruled out that access to grid power could be an ongoing problem for the project. However, Forrester does not deny that power is critical for the project to progress, “It’s an issue which has to be resolved. We raise money in the market and unless we can show that we can ultimately get this into production, then we won’t get the confidence of the people that are supporting us. So if, as Forrester expects and is counting on, all the cards fall into place over the next two years the project should be in production in 2020 or before. The major tranche of work this year will be to drill out the Nxuu resource into a indicated and measured resource compliant with JORC 2012 and enter into a feasibility study in 2018. Based on the proposed production level of 750,000tpa the project will not require heavy capital expenditure on a large plant and therefore when power is delivered on site Mount Burgess can move full steam ahead with realising the Kihabe project to its full potential.